Get 100% up to a $1,000 cap on your first deposit with this code. Free Jackpot Poker entries guaranteed to be at least $50. No gameplay required. Up to $1,000 in private depositor freerolls. Play every Saturday for a month. So what’s the fatal mistake? Listening to 95% of poker affiliates who have never played at America’s Cardroom, don’t keep their pages updated, or both. 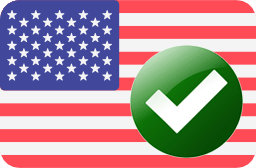 So you’re a prospective player looking for the best America’s Cardroom bonus code. Good, you’ll probably be pretty happy there. I have been overall, which is why I wrote a 8,941 word review on what I’ve seen as a real player here since 2004. Here, I’m going to paint you a real picture of how to get everything and how good it really is, including the rare instant bonus that too few even know exists. 1.4 How do you claim all 20 free Jackpot Poker bonus promo cards? 1.5 How do you claim the 100% bonus? 1.6 What exactly do you get with this America’s Cardroom bonus code? 1.6.2 Is there an ACR reload bonus? 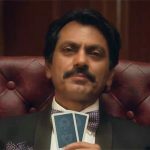 1.7.1 What is Jackpot Poker? 1.9 Is this Americas Cardroom Bonus Code a good deal? 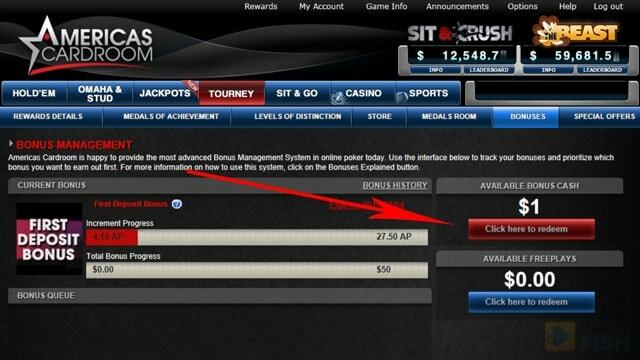 ACR releases $1 of the bonus every time 27.5 Benefit Points are earned through play. It’s extremely easy to get every poker promo benefit. 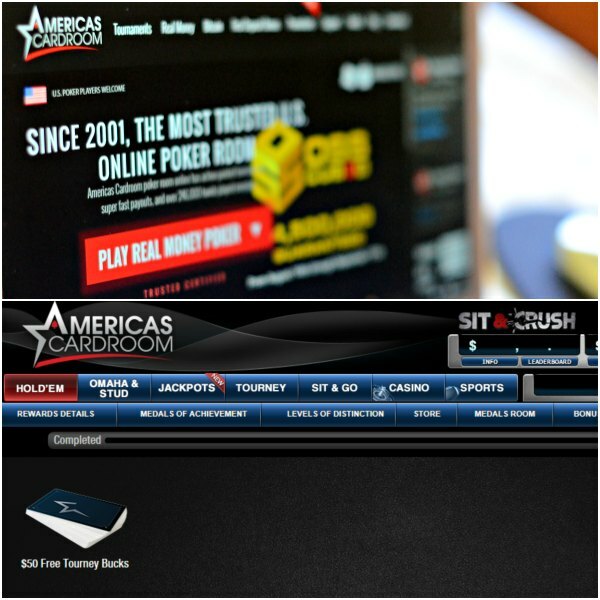 First, visit America’s Cardroom and click the big download button on the main page. They have a Windows and Mac client. 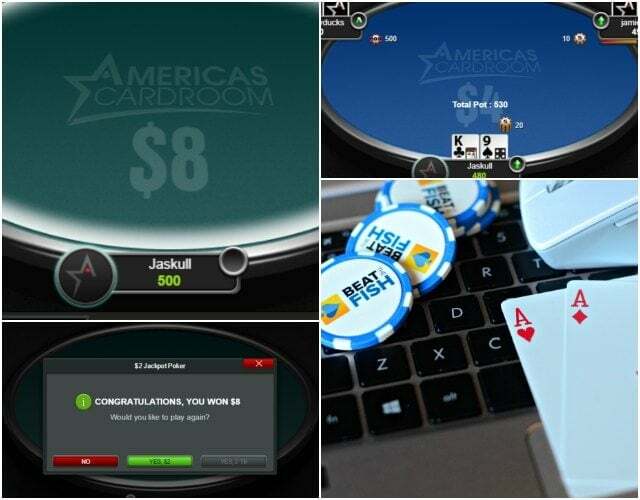 Install the file and open the America’s Cardroom software. Click on “Create New Account”. 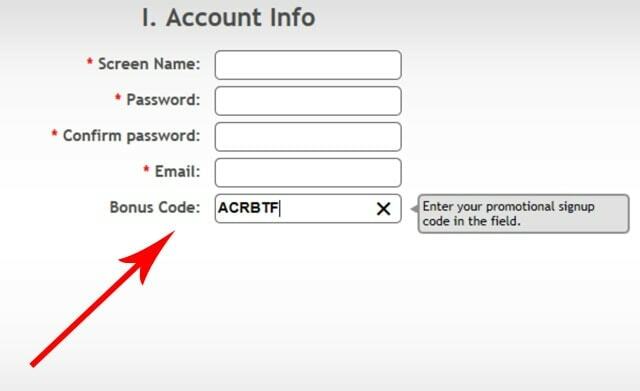 Enter your account details and be sure to fill in ACRBTF in the “Bonus Code” field. 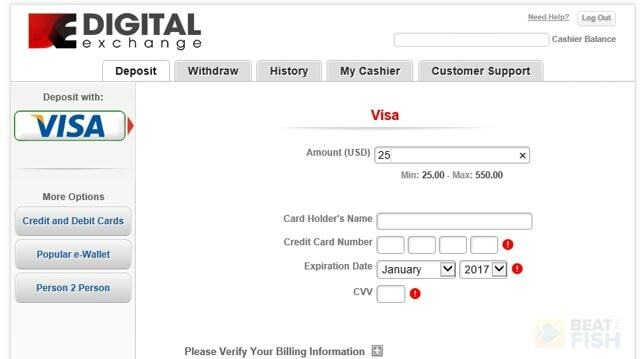 Confirm your account by email, return to the software, and click the “Cashier” button in the bottom-right to enter the cashier. Make any deposit starting at $25 using any method and you’ll be entitled to all the bonus code benefits. ACRBTF will unlock the full ACR bonus package with any deposit method, so there’s no need for a separate Bitcoin promo code. How do you claim all 20 free Jackpot Poker bonus promo cards? After using your America’s Cardroom bonus code and making your deposit, click the “Rewards” tab at the top, “Special Offers” on the right side, and then click the card to spin for your prize. You get 20 of them free, but be sure to claim them every day or you forfeit that day’s prize as I did here! 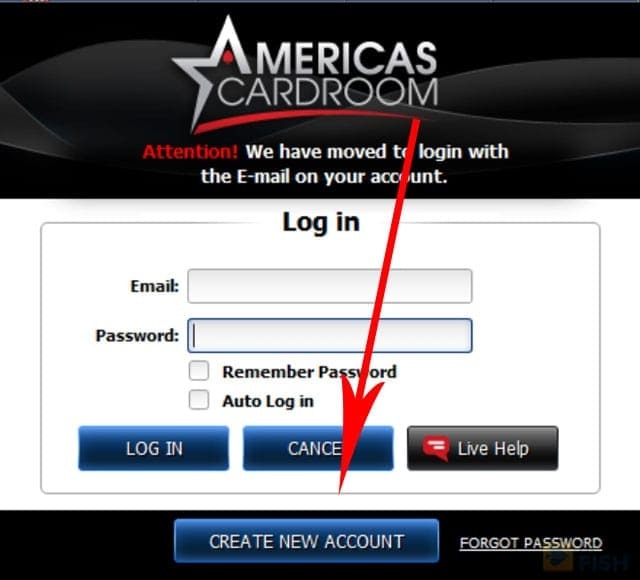 Log in to the America’s Cardroom software. Click the Rewards tab and then Special offers. Click the $50 free tourney bucks graphic. Click today’s card and redeem your prize of $2-6. Repeat every day for 20 days. 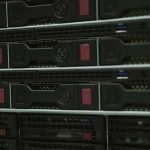 How do you claim the 100% bonus? The 100% portion of the bonus code is released by earning Award Points. You can check your progress in the Bonuses tab. Note that each time the red bar fills you earn $1 and you have to click this button to transfer it over to your cash account. Start earning America’s Cardroom Award Points by contributing rake in cash games or tournament fees. Every time you earn 27.5 Award Points (the equivalent of $5 of rake) you’ll receive $1 in real money. You’ll have to manually redeem your cash by clicking “Rewards” and then the “Bonuses” tab. After clicking the redeem button you’ll immediately see cash added to your cashier balance. 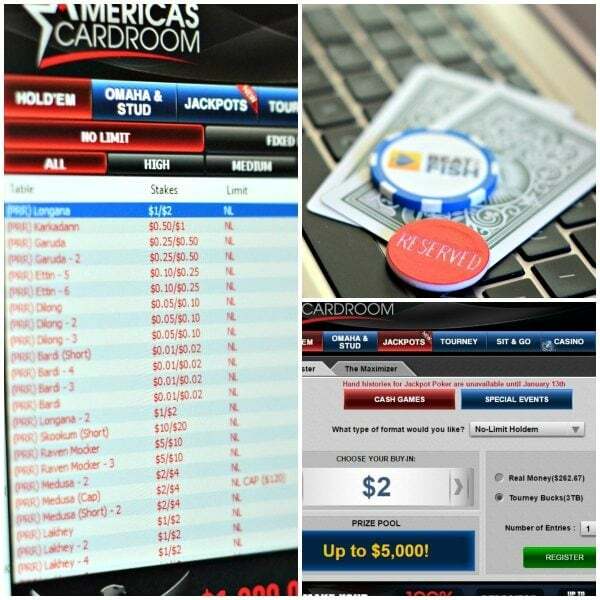 What exactly do you get with this America’s Cardroom bonus code? When America’s Cardroom announced a new part of their bonus, I gave it a psychological shrug. Sure, I would need to update my review for 2019, but I’ve been around long enough to see through most bonuses. 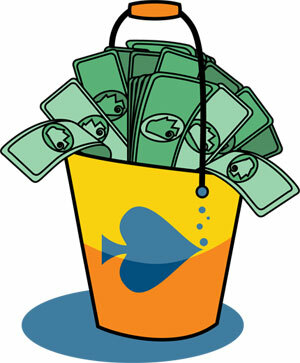 Online poker rooms use bonuses as marketing tools, not as realistic rewards for everyday players. They’re structured in a way to give players as little as possible through confusion and complex requirements. This one is different, which is why I’ve been mentioning it everywhere I can on the site lately. At the conclusion of each hand you contributed rake to you’ll see a quick display of the Award Points you were awarded above your screen name. This is what you’ll need to build up to clear your bonus. A maximum-rake hand usually earns 5-6 Points. This is the standard bonus that’s plastered in a large font at every online poker site you’ve ever visited. It’s 100% and valid on all deposits up to $1,000. $1,000 is a pretty large cap, but, as with 99% of all poker bonuses you don’t get it just credited to your account. You have to clear it through either cash game or tournament play. 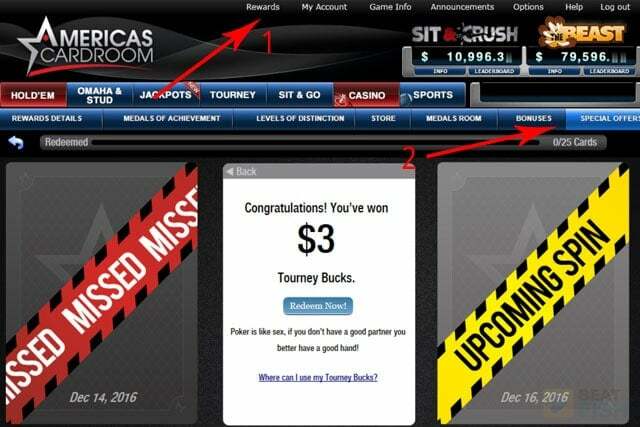 America’s Cardroom has never offered a no deposit bonus code. Is there an ACR reload bonus? There is currently no ACR reload bonus and this promo code is only valid for players making a new account. America’s Cardroom occasionally offers reload promotions for 1 or 2 weeks at a time, usually giving players a 50% bonus up to $300. This is only valid on one reload deposit and is released at a rate of $5 for every 120 Award Points earned. There’s one key I really like about the America’s Cardroom promo code play-through offer and that’s the increment the bonus is cleared. Every poker site clears bonuses like this in increments or stages when you’ve earned enough player points, which are earned by how much rake you contribute in cash games or tournament fees you pay. Every other site makes those increments $5, $10, or even something wacky like 10% of the bonus. Translation: You’re going to be playing a while before you see any of it as usable cash. What America’s Cardroom does is release bonus money for every $1 earned. That means you’ll actually see the bonus faster. In 2019, if you register using bonus code ACRBTF your bonus funds will be released in $1 increments for every 27.5 ACR Award Points accumulated. The points are accumulated at a rate of 5.5 points for $1 in rake paid at cash tables or in tournament fees. Note that America’s Cardroom uses the weighted contributed rake system, which only counts the rake for players who actually put the money in the pot based on the amount invested. This can be obnoxious when you’re card dead and getting no Award Points, but I’m guessing the end goal of America’s Cardroom is encouraging more action, which in turn creates more rake for them and higher quality games for players. Simply put, every time you pay $5 in rake, you’ll receive $1 back from the America’s Cardroom welcome bonus. That’s effectively a 20% rakeback from this part of the bonus alone. Jackpot Poker is the America’s Cardroom version of the Spin & Go: a 3-player hyper-turbo Sit and Go where the winner takes all. You can play in at least a $2 Jackpot free for 20 days with this bonus code. About 1 in 5 will have an $8 prize pool. Why do I talk about this part of the bonus code so much? It’s instant. It’s free on any deposit. No strings. And you don’t have to play a single hand to get it. That stands out to me because instant no-play bonuses are so hard to come by these days. Only PokerStars offers anything similar, which US players can’t take advantage of. You get 20 free cards that give a random tournament dollar amount between $2 and $6. I usually got $3 for my bonus. You can redeem 1 per day and they’re usable for Jackpot Poker Sit and Go buy-ins. You keep all the winnings. There’s no risk because you’re only playing with your free tournament cards. You’re guaranteed to get at least $50 in America’s Cardroom tournament entries if you deposit $25 or more. I got about $65. That’s more than double what you have to put in. They’re 3-player winner-take-all Sit and Go’s in a hyper-turbo quick blind format. Everyone only get 500 chips. Most Jackpots only last a few minutes, but I’ve played in some that took 10-15 minutes. The “Jackpot” comes in because the prize pool is random. Most of the time it will be 2x the buy-in, but over 25% of the time they will be 4x or greater. The upper limit is 2,500x, which can happen less than .01% of the time. You can play in a free $2 Jackpot every day you redeem a card or save them all up to enter a $40 buy-in one and still have some tourney bucks left over. 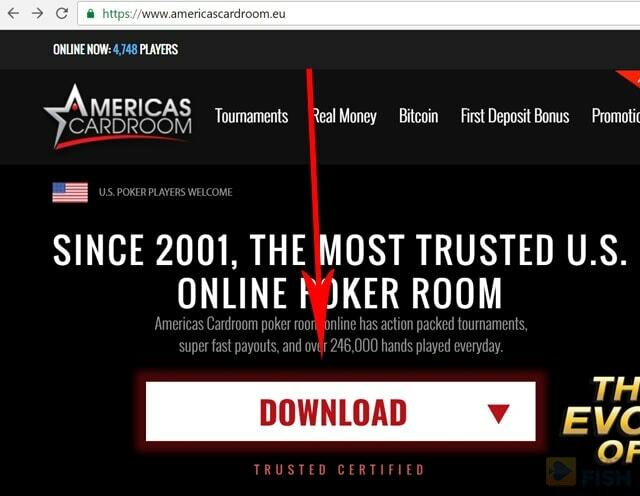 A lot of other poker affiliate sites with America’s Cardroom bonus code pages aren’t even talking about the 20 free tournament cards as they don’t actually play at the poker rooms they review or return to their pages to update them. ACR also doesn’t do a stellar job at advertising it, although they’ve finally added it in more prominent spots on their site. Kudos to America’s Cardroom for doing something different that genuinely stands out and gets the interest of this skeptical veteran. By making the first deposit you’ll also be eligible for $250 First Depositors Freerolls. These events are played at America’s Cardroom every Saturday at 12:05pm ET. Check the Freerolls tab in the tournament section to find them on the schedule. All new depositing players receive entries for the first next Saturday and all other Saturdays during the month. 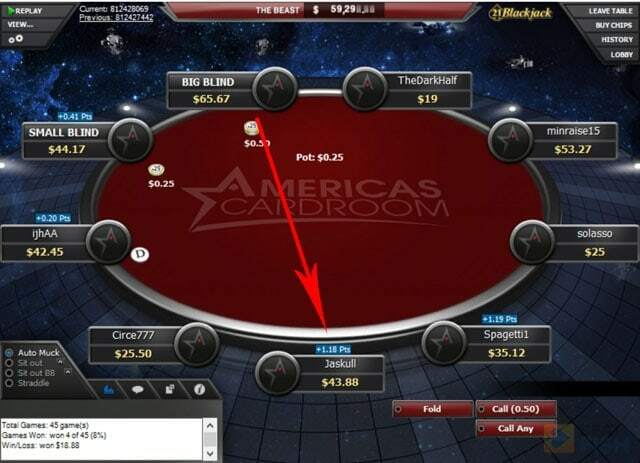 Is this Americas Cardroom Bonus Code a good deal? 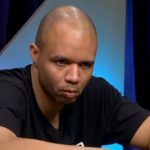 As of 2019, many online poker sites have been moving towards offering worse rakeback deals for their players and, in general, reducing promotions and rewards. This trend has been the most unfavorable for serious players who have hard time finding a place that appreciates their patronage. This bonus code offer stands out in that regard. The welcome bonus and tournament tickets you receive make up for arguably the best deal available on the market. The clearance rate with this promo code of 20% is pretty decent as well so if you play even semi-seriously you should have no problems clearing the full America’s Cardroom welcome bonus. America’s Cardroom has a decent rewards program overall with instant cash bonuses you’re guaranteed to get for reaching certain thresholds. The most obnoxious part? Requiring a certain number of points earned per month to keep your rank. Of course, as you’re working off the play-through bonus and entering Jackpot Poker tournaments you’re still eligible for the standard rewards program. Here’s what you can expect to earn over time. All players get to participate in a VIP scheme featuring a military theme. As you play at cash tables or join tournaments you’ll collect Rank Points. These are separate from the Award Points you’ll get to clear your bonus and are earned at a faster rate. Rank Points will determine your Rank, which then determines the multiplier used on the base Points collected. Furthermore, your Rank Points accumulate during the year. As much as I can’t stand the monthly requirement to maintain your Rank at least your total points are counted annually. As players reach certain annual milestones, they are awarded Achievement Medals. These Medals are, in fact, cash bonuses, awarding $1,200 in total. Once you’re done with all the Medals, you can then proceed to move up through the Levels of Distinction, which can net you nearly $130k. Of course, the highest levels are incredibly hard to achieve, but probably not impossible for the most devoted of mid-to-high-stakes grinders out there. Overall, this America’s Cardroom bonus code is one of the better deals to come around in a while, mostly thanks to the $50 in guaranteed Jackpot Poker money. Small-stakes players will like it since they’ll actually see a bonus for a change. I honestly don’t make many pages like this dedicated to bonus codes. Most bonus packages are filled with player-robbing cliches and mediocre offers that I would have a tough time filling a Post-It with interesting things to say about them. This America’s Cardroom bonus code offer is strong enough that it deserves its own page. The instant free tournament bonus is what stands out to me most as it’s the rare benefit that even penny-limit micro-stakes players can earn. Higher-limit players will be going for the 100% offer, which has a substantial cap at $1,000. America’s Cardroom has also been trending in the right direction over the past several years, enough so that you’ll probably stick around even after the bonus promo offer has dried up. One of the better offers online right now with the free tournament entries really standing out besides the 100% bonus. You get a free spin every day for 20 days that nets you a minimum of $2 each in real tournament money immediately. It’s guaranteed to be at least $50. is this only for new deposits or will it work for any deposit? 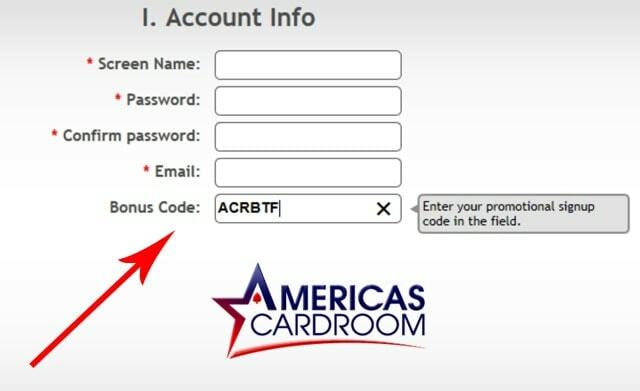 America’s Cardroom actually only lets players enter this code for the full bonus package when they first create their accounts. When you’re selecting your screen name, password, and other details, that’s where you’ll see the space to enter the code. Then, once you make your first deposit, you get the free tournament money for 20 days, the play-through 100% bonus, and access to the freerolls. Unfortunately, ACR doesn’t always run promos for reload deposits. Sometimes they do, usually for a 50% play-through bonus. I thought the free money was too good to be true but I tried this yesterday at ACR. Put in $25 of Bitcoin and I’m on my second day of the free jackpot cards. Jackpots are frustrating lol but whatever it’s free and I won one of them for a few bucks. Thanks. Thanks for the comment and, ha, good nickname there. I’m glad it’s working out for you. Personally, I think that ACR doesn’t help new players understand the free tournament money aspect of the bonus code enough. Players are trained to look for the big percentage, but really, the $50 in free entries is a better promo for most players. That’s especially the case for low-stakes players that don’t usually rake enough to clear big bonuses. Sure, Jackpots are luck-filled madness, but you’re getting to play them for free and you’re bound to win some of them. Those winnings go straight into your real-money balance. Bonus code ACRBTF gives a complete bonus.